Even people not associated with the commercial vehicle industry may well know the name Dhollandia. It is a brand recognisable to many motorists who have sat waiting in traffic, as it is emblazoned on many of the tail lifts fitted to trucks up and down the country. It may well become an even more common sight on PCVs too, as Dhollandia’s Passenger and Van Lift Sales Manager, Eddie McIver, works to promote greater sales of its products in the bus and coach market. Eddie is spearheading a push into the bus and coach market, which is one Dhollandia is familiar with, especially in mainland Europe. 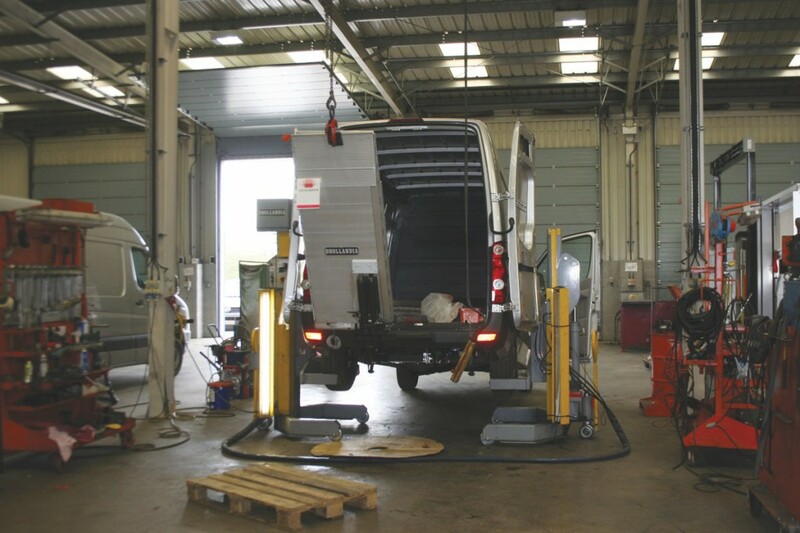 Units from the range of hydraulic tail lifts are commonly used on PCVs on the Continent, considerably more so than they are in the UK. ‘Great Britain is a bastion we have yet to fully breach’, he said. The aim is to replicate successes achieved elsewhere in Europe, where the company has formed a number of allegiances with manufacturers, for instance with Van Hool, having done a considerable amount of work for the Belgian manufacturer. Since taking on his current role, Eddie has been working to make the British market aware of the brand’s range of products suitable for buses, coaches and minibuses. Not only is he targeting PCV manufacturers, he would also like to see them specified for retrofit applications. 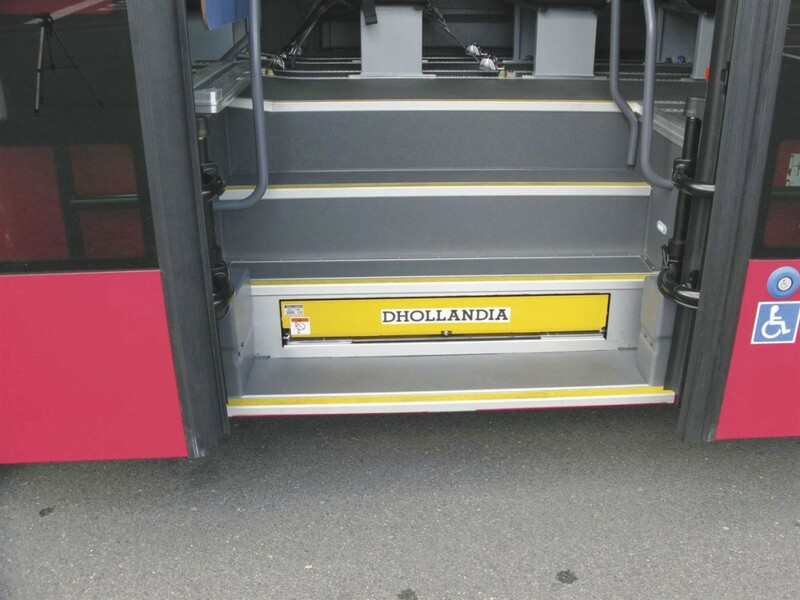 One Dhollandia product widely installed in Europe is the DH-RB.05 500kg wheelchair lift for coaches. In its travel position, the lift is folded away in a locker beneath a door on the side of the coach. On deployment, it is lowered to the ground and unfolded into its working position. 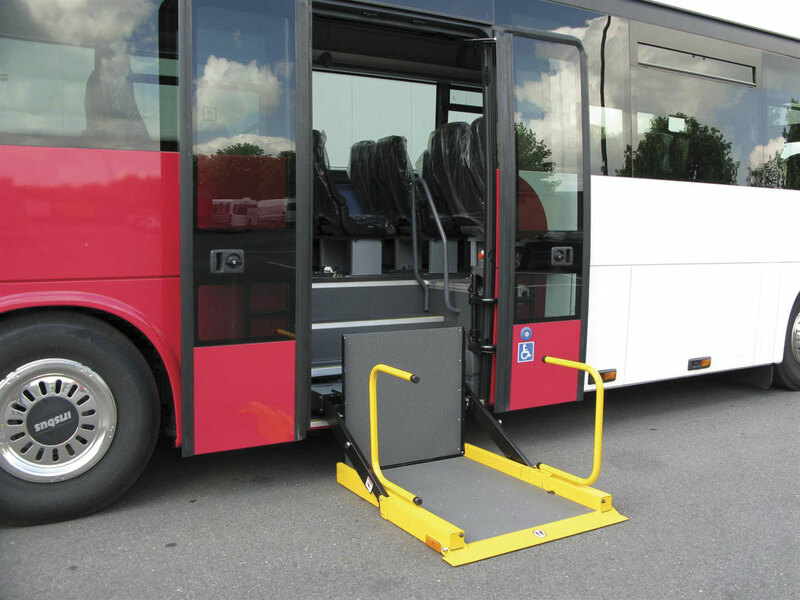 The standard model is mounted directly under the door, but as an option it can be equipped with a side shift frame, making it suitable for coaches where the door position is offset from the lift stowage space. The 500kg weight capacity enables it to handle the heaviest of wheelchairs. As part of the sales drive, Dhollandia recently exhibited at the CV Show. When not exhibiting at trade events, Eddie is on the road, demonstrating to potential clients. Behind this relentless marketing is his belief that the products, as well as the company, are at least as competitive as others serving the market. Dhollandia has proved it can succeed elsewhere in the UK, with ambulances one sector in which it does particularly well. 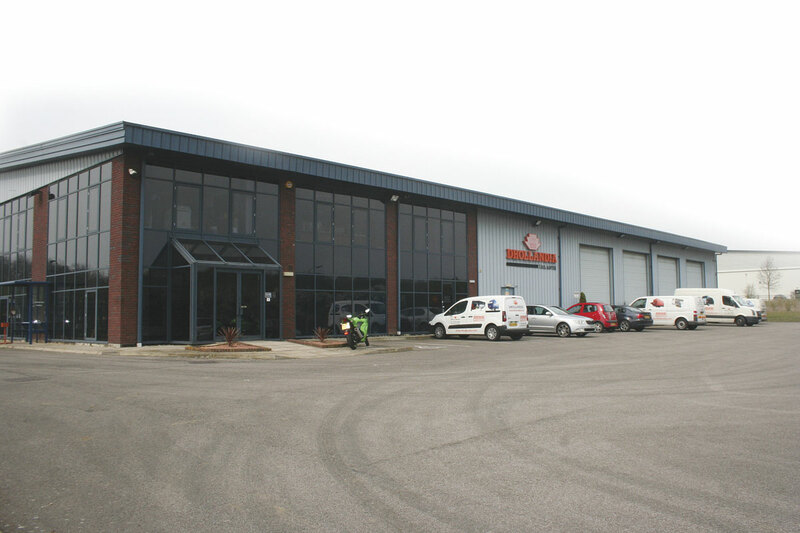 One of the company’s biggest customers is the East of England Ambulance Service. 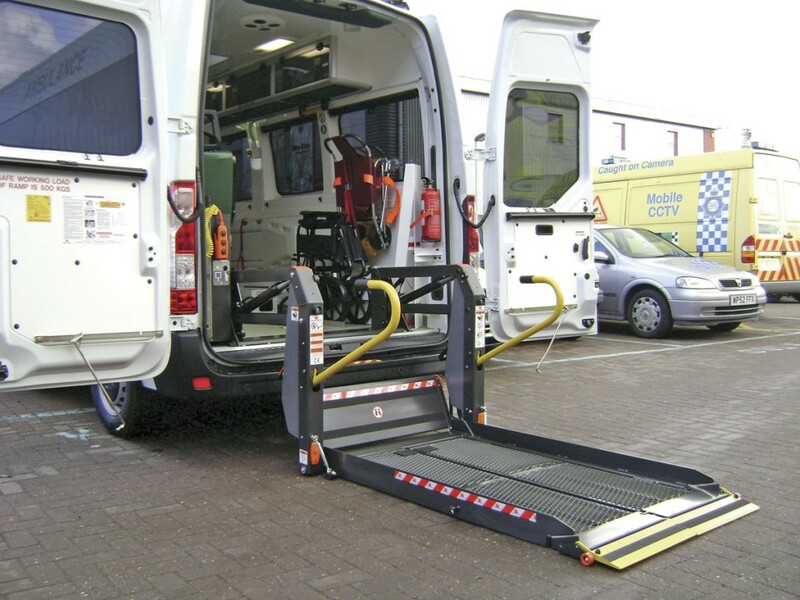 For welfare vehicles of all types as well as many other minibus applications, it has the DH-PH2 fully automatic linear passenger lift. This is suitable for mounting inside the rear doors. The lift has two arms designed to provide platform stability, as well as to increase the safety and sense of safety for the wheelchair passenger and the lift operator. For similar applications, Dhollandia has the DH-CH001.3 300kg capacity lift, which has a sealed cassette box under the loading floor of the vehicle. The solution keeps the access through a van-converted minibus free and occupies no space internally. The lift is retracted hydraulically and is equipped with an aluminium step. Dhollandia has a great deal of manufacturing experience and know-how, producing in excess of 20,000 units per year. It gives credence to its claim that it is Europe’s leading manufacturer of hydraulic lifts. According to its marketing material, the company has manufactured over 450,000 tail lifts to date. Eddie believes that focusing solely on tail lift design, development and production is one of the advantages of the company, enabling it to apply the lessons learned in different sectors of the wider lift market and utilise them for the benefit of all. Around 90% of the hydraulic, electrical and mechanical components used on Dhollandia lifts are manufactured in house, he told me. The advantage of this is that it makes the company ‘master of its own destiny’, with optimum control over its products’ quality and build. It also helps when innovating within the range, allowing it to design almost every aspect of the products in line with customer feedback. It gives Dhollandia the flexibility to identify new ideas and develop projects that embody them quickly. It also enables it to test output quality on a constant basis. According to Eddie, reliability is another area that sets his products apart. The lifts benefit from what the company’s marketing material describes as an ‘intelligent simplicity’ in design, meaning that they are robust yet uncomplicated. He explained that the control units have no electronic components, such as printed circuit boards, which he claims makes them less susceptible to failure and easier to maintain without specialist knowledge. A pioneer in hydraulic tail lifts, Dhollandia was established in 1968 by the Dhollander family. The business has grown dramatically since then from a small Belgian business to one of Europe’s largest tail lift manufacturers. It now has four production sites, located in France, Belgium, Slovakia and the Republic of Ireland. It is the Irish facility where the majority of its passenger lifts are made. These sites do not include the numerous distribution centres, which provide the lift specialist with a presence in various countries throughout Europe. The Huntingdon site is one of these centres. From the UK base, Dhollandia operates a sales, stocking and service network working alongside 64 independent repair and service agents who undertake repair and maintenance packages for customers, including roadside breakdown technical support. The company has the capability to install lifts at Huntingdon and provides training on site, allowing customers to visit and receive a variety of tuition in how to care for and repair the lifts. Dhollandia’s entire range of passenger lifts is available in the UK, including its DH-CH.100-103 heavy duty cassette lifts designed for full size buses and midibuses. The various models in this range are designed for particular mounting positions: under the chassis, in a compartment high above the ground, on the luggage compartment floor or integrated into the stairs at the access door. Their lifting capacity can range from 300 to 450kg. 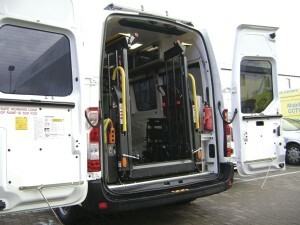 For urban buses, it has the DH-TV 300kg lift. The product is usually mounted at one of the side doors and occupies the space otherwise filled by the access stairs. Upon deployment, the device transforms from a stair into a lifting platform for wheelchair access. The company’s tail lift range features its Protection PLUS paint finish. This sees the steel components go through a shot blasting and acid degreasing process before having the first layer of protective paint applied via cationic electro coating. This sees the coating applied through electrostatic deposition, a technique widely used through the automotive industry for optimum paint coverage. Epoxy KTL is used, which is an extremely high quality primer paint. It is then given a polyester powder top coat for even more protection. Further to this, some of the products now benefit from hot dip zinc plating, zinc offering physical and electro-chemical protection of steel. The company’s marketing material claims this gives the lifts ‘unrivalled’ protection against corrosion. Aluminium is also commonly used to build its products, leading to better durability. In addition to lifts, Dhollandia also supplies fully automatic electric ramps. The DH-BRE range is designed to assist wheelchair passengers and parents with a baby buggy. They are fitted with a safety carpet and a safety edge with an emergency stop function, as well as emergency controls. There are models available for fitment in the vehicle floor or under the floor. New products are constantly being developed by Dhollandia, with Eddie saying its lifts are ‘constantly evolving to meet users’ demands’. Its team of specialist engineers use powerful robotised machining centres and other state of the art technology to develop and manufacture a wide array of hydraulic lifts and components. A focus within lift design at the moment is how they can be made capable of raising heavier weights. This is the case because wheelchairs and their occupants are getting heavier. Also, with Euro6 meaning heavier vehicles, another issue the company is having to look at is how it can keep its products’ weight down. This design process is all about meeting customer demand, which is something Dhollandia know a lot about. Although the company supplies an extensive range of standard models, most of which are available with a choice of arm lengths and widths to suit different applications, the company also offers bespoke solutions. Platforms can be ordered to custom dimensions, whilst mounting systems can be adapted for varying chassis designs. This relates to something Eddie said was one of the advantages of Dhollandia: ‘We are small enough to care and big enough to cope’. It can handle the smaller, single orders for retrofit bespoke to requirements, whilst at the same time supplying large orders for thousands of units. 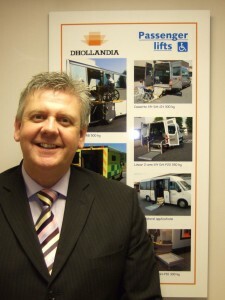 Eddie is an old hand when it comes to passenger lifts; he has been involved in the industry for years. His enthusiasm for promoting Dhollandia to bus and coach operators is nothing short of inspiring. With the company’s expertise in tail lifts, backed up by Eddie’s knowledge and passion for the products, the brand is well placed to meet the challenge of the UK bus market and capture the greater penetration it seeks.